Global warming is the most severe environmental challenge faced by humanity today and the costs of responding effectively will be high. While Russia's ratification of the Kyoto Protocol ensures the treaty's entry into force, lack of capacity, or incentives to renege on their commitments, will impede mitigation efforts in many countries. An important prerequisite for the proper functioning of the Protocol is that its compliance system - which is spelled out by the Marrakesh Accords - proves effective. 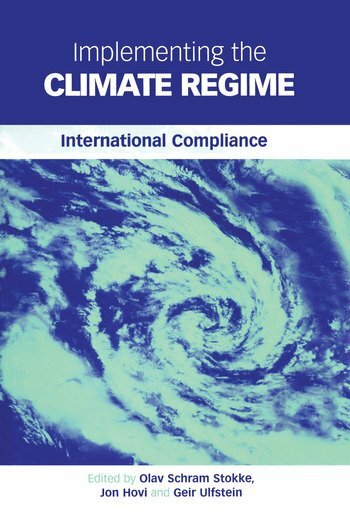 Implementing the Climate Regime describes and analyses Kyoto's compliance system. Organized into four parts, Part I describes the emergence and design of the compliance system, while Part II analyses various challenges to its effective operation - such as the development of norms, verification and the danger that the use of punitive 'consequences' may also hurt compliant countries. Part III discusses the potential role of external enforcement, with particular emphasis on trade sanctions. Part IV addresses the relationship between Kyoto compliance on one hand, and international governance, oil companies and green NGOs on the other. Olav Schram Stokke is a Senior Research Fellow at the Fridtjof Nansen Institute in Norway. Jon Hovi is Professor of political science at the University of Oslo and a Senior Research Fellow at CICERO Center for International Climate and Environmental Research-Oslo. Geir Ulfstein is Professor of law and Director of the Norwegian Centre for Human Rights at the University of Oslo.